Here at VegKitchen, we’re big fans of maca root, and want to make sure to cover all our bases. 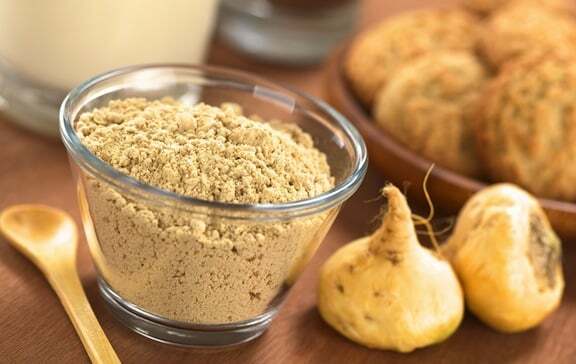 Maca, a root that belongs to the radish family, is most commonly available in powder form and considered a superfood rather than a supplement. Learn more about the benefits of maca, and get even more info by exploring our frequently asked questions about maca root. 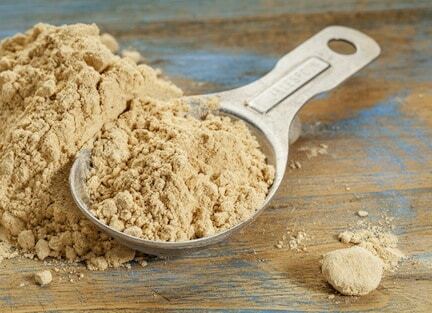 In its long history of use, maca has shown no adverse side effects or toxicity, nor have there been cases of overdose. Maca’s general safety has been confirmed by the National Institute of Health in a study. You can read more about the subject at The Maca Team. As with all good things, maca should be used in moderation, balanced with other natural foods. 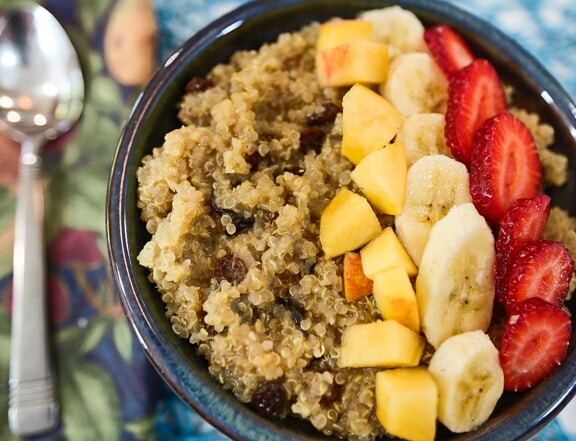 For example, it’s great in Quinoa-Maca Breakfast Bowls, shown just below. Stomach upset: Some maca users have reported stomach upset, heartburn, and indigestion, though this isn’t a common occurrence. Though unpleasant, these effects aren’t harmful and will pass. If maca disagrees with you to such an extent, listen to your body and don’t use it! There are other superfoods to explore, for instance, hempseed, which might be more agreeable to you. Thyroid issues: Raw maca contains iodine and other goitrogens, which can irritate the thyroid. Maca labeled “gelatinized” (more about that later) has been cooked, which mitigates those substances. If you have thyroid issues, you should consult a Registered Dietician before using maca. Traditional MDs are less likely to be familiar with it. Jitters: If you’re just starting to use it, or use too much at once for your body weight, maca can make you feel jittery or wired, almost like caffeine might (though maca doesn’t contain caffeine).Since maca is energizing, this is quite possible. If this happens, simply reduce the amount you’re taking. Sleeplessness: As with jitters, it’s important to remember that maca is stimulating. If you find it interferes with sleep, take it early in the day. Here’s an area where there’s debate pro and con, and the authors and contributors to this book aren’t in a position to take a stand. Discuss the matter with your practitioner if you’re pregnant or lactating, and want to start or continue taking maca. Little formal research has been done on the safety of taking maca during pregnancy. Some health care professionals believe it’s safe to take throughout the entire pregnancy, while others point out the possible dangers of choosing to do so. On the pro side are those who feel that because maca has no side effects, it might be a good natural alternative to prenatal vitamins, and can help balance the hormones, especially during the first trimester. Other practitioners worry that maca may raise testosterone levels in the expectant mother to a degree that’s not desirable. In many cases, herbs and other foods like maca that have near-pharmaceutical qualities aren’t recommended during pregnancy and lactation. Bottom line: Err on the side of caution, and talk to your practitioner and/or Registered Dietician before making a decision. Is maca safe for children? Maca is believed perfectly safe for children, but in much smaller amounts — perhaps 1/2 teaspoon, once in a while. The easiest way to enjoy maca is to incorporate it into smoothies and other preparations that are on the sweeter side. 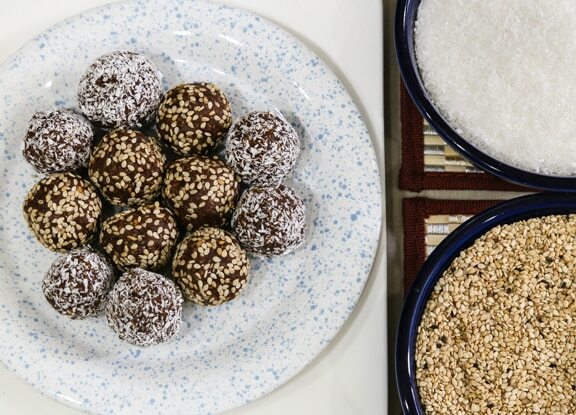 Here are 5 Easy and Tasty Ways to Use Maca in Food.